A ‘complete street’, as defined by the National Complete Streets Coalition (NCSC), is a street where the entire right-of-way is planned, designed, and operated for all modes of transportation and all users, regardless of age or ability. This results in a well-balanced transportation system providing various choices for mode by all individuals who utilize the complete street. Complete streets provide mobility, support livability, and spur economic development objectives, while providing more mode choices. 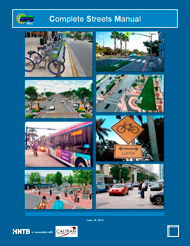 A typical complete street contains the elements including, but not limited to, improved accessible sidewalks with frequent and safe crossing opportunities, bicycle lanes, defined pedestrian and bicycles spaces including bicycle parking, street trees and benches, pedestrian scaled lighting and accessible pedestrian signals, special bus lanes, comfortable and accessible public transportation stops, median refuges, landscaped curb extensions, roundabouts, on-street parking, among others. As described by the NCSC, there is no one singular design prescription for a complete street – each one is unique and responds to its community context. 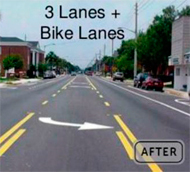 A complete street in a suburban area may look different than a complete street in the urban core, but both are designed with the same principles in mind – to balance safety and convenience for everyone using the road. This study employs site-specific planning decisions that reconfigure existing road space in a manner that better accommodates the needs of all of the users within the corridor. Implementing complete streets and supporting policies can have a positive impact on our environment by reducing the community’s reliance on automobiles, and encourages the use of viable transportation modes including walking, bicycling and public transit. Complete streets provide better access to businesses, promote greater street activity, and can lead to an enhanced sense of community. Making it easier for residents and visitors to take transit, walk, or bicycle to their destinations can help them save money and stimulate the local economy. This extra savings means that residents can spend money in other ways including housing, restaurants, and entertainment, which keeps their money circulating in the local economy. Locals of Edgewater Drive wanted to see the street design support its main street status instead of serving as a drive-through street for commuters. 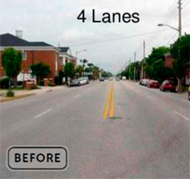 To help enable the 1.5 mile lane reconfiguration, the street was transferred from State (FDOT) to City jurisdiction. Edgewater Drive was converted from two travel lanes in each direction to one, a two-way left turn lane, and bicycle lanes. As a result, the redesign reduced speeding and accidents (34% reduction in crashes), increased pedestrian and bicycle volumes (up 23% and 30% respectively), increased on-street parking use rates, and improved overall community vibrancy. A number of new businesses also opened on the street following implementation.